Two Soda Campaign? What About a Third “Party” Choice? PROVIDENCE, RHODE ISLAND (August 3, 2016) – We all agree that Yacht Club soda is an iconic Rhode Island brand. And (unlike a certain iconic building), we want the independent, family-owned Yacht Club Bottling Works to be around for another 100 years. Imagine our surprise when we realized Gary Johnson, Libertarian Party candidate for the Presidency of the United States, was not included in Yacht Club’s great #SodaPopPoll. But Yacht Club Bottling Works owner John Sgambato came right to the rescue. The Libertarian Party of Rhode Island (LPRI) is proud to announce the selection of sarsaparilla as the official soda flavor of the Libertarian Party of Rhode Island for the 2016 Presidential Election #SodaPopPoll. 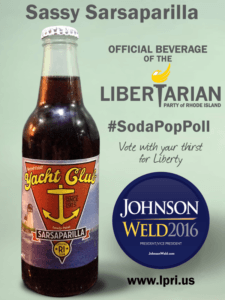 Rhode Islanders with a thirst for liberty cast one vote for each bottle of Yacht Club sarsaparilla they buy. #SodaPopPoll continues through the November 8 election.